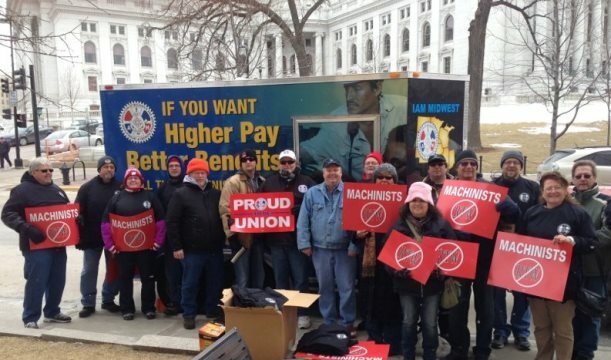 IAM District 10 members gather at the Wisconsin State House in Madison on February 24, 2015 to protest a right-to-work bill being rushed through the state legislature. After saying in his re-election bid that he wouldn’t push for so-called right-to-work legislation, Wisconsin Gov. Scott Walker (R) now says he will sign a bill being railroaded through the state’s General Assembly to make Wisconsin the country’s 25th right-to-work state. Labor activists will protest at the state Capitol in Madison on February 24 and 25 while the state senate holds hearings and debates the measure. The bill could come to a full floor vote as early as this week. Add your name to the petition to stop right to work. Watch “The truth About Right-to-Work Laws” on the Machinists News Network. Living in a “right-to-work state” does not mean you have the right to work. Or that you don’t have to join a union. No one is required to join a union under federal labor law. But the same law mandates that unions represent every worker in a workplace where the majority of workers have voted for union representation. Right-to-work laws take advantage of this obligation by making it illegal for companies and unions to negotiate agreements that say workers will pay for at least their fair share of the cost of collective bargaining. Big Business interest groups like the American Legislative Exchange Council (ALEC) and the National Right-to-Work Committee know that the legislation siphons power from workers, and ultimately fattens corporate profits. Studies show that states with right-to-work laws on the books have higher poverty rates, more workplace injuries and fatalities, less employer-sponsored health insurance and lower wages. Right-to-work advocates say the law will make Wisconsin more attractive to business. 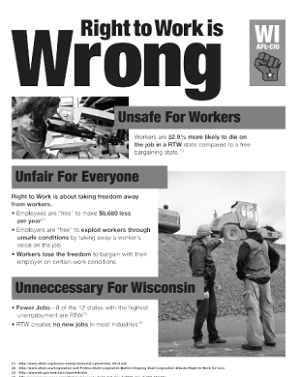 Click here for a flier on why right to work is wrong for Wisconsin’s economy. Wisconsin Gov. Walker, touring the country in anticipation of a probable run for president in 2016, already stripped collective bargaining rights for most of the state’s public employees when he signed Act 10 amidst mass protests in 2011. Do you live in Wisconsin? Attend a rally at noon tomorrow, Wednesday, February 25, on the State Street side of the Capitol in Madison. Visit the Wisconsin AFL-CIO website for more information and updates.